I got a little bit behind on making my Happy House blocks for my RSC block this year and I finally sat down and got caught up on both purple for January and teal for February. I could fit that into a snack sized zipper bag, ladies. There is hope for the scrap laden and maybe I could get another pile reduced like that over the next year. I had slightly less trouble with picking teal fabrics for houses, but still found that I had mostly small pieces. One of the reasons I had set this WIP aside is that it requires quite a bit of blue and brown for the sky and the roofs. I had enough scrap for one brown roof and then pulled an older brown fabric from my stash (actually used in this quilt). I found a light blue fabric in my "big scraps" scrap box and used essentially the whole piece to make these five blocks. I'm going to have to either dig deeper into my stash or buy some additional sky blue fabric going forward. For the doors and windows, I picked fabrics that coordinated and contrasted with my siding fabrics. These pieces each are 2.5 inches wide or tall, so I cut them from my leftover jelly roll strip stash. Now to wait and see what color Angie picks for March! Sharing at Needle and Thread Thursday, Scrap Happy Saturday, and Oh Scrap! 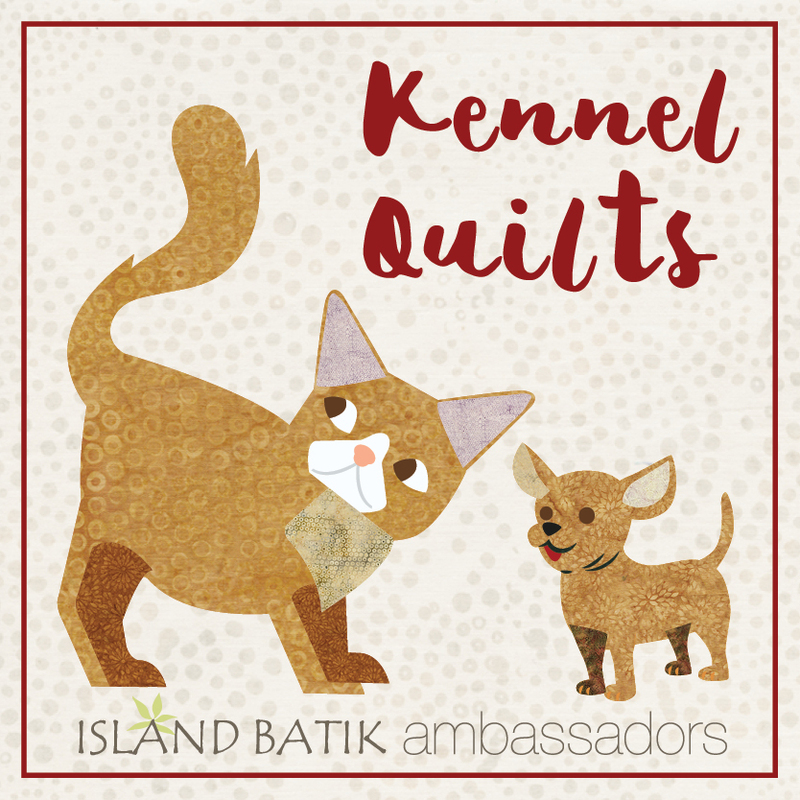 Kennel Quilts with Island Batiks! Today I'm sharing a fun project with a purpose as a part of being an Island Batik Ambassador this year! 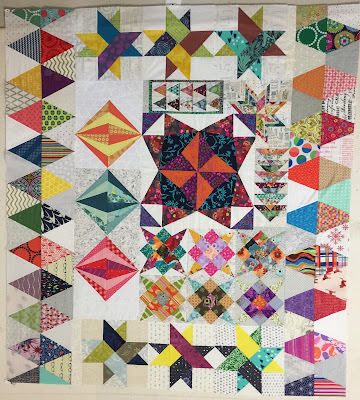 The Small Kennel Quilt Team is a volunteer organization sponsored by The Quilt Pattern Magazine that springs into action when disasters strike, sewing small kennel quilts for animals in need while they are separated from their humans and possibly injured. Creating kennel quilts is a way for quilters to help our animal friends in times of need by doing what we love. Click here to learn more! Both of our bunnies (Clara and Frankie) came from our county animal shelter, so I am always in favor of helping our furry friends! Today I'm using the Fresh Catch collection from Island Batik. I pulled out some selected pieces from a 10 inch stacker for this project. Can you see the fishes? Using your two 10 inch squares, layer right sides together and cut into four pairs of 5 inch squares. Draw diagonal lines on each pair, sew 1/4 inch from each side of the line, cut apart on the diagonal line, and press. Trim each HST to 4.5 inches. You will need eight (8) HSTs. Layer your parts together as follows: batting, pieced top right side up, backing fabric right side down. Sew 1/4 inch from the edge around the piece, leaving an opening for turning. Trim corners to reduce bulk. Turn your mat inside out so that the pieced top and backing fabrics are on the outside. Press and topstitch around the outside of your piece. Quilt if desired. I added some stitching using one of the decorative stitches on my machine. And just a quick hint -- these turn out 12 inches by 18 inches -- which is a pretty good side for a placemat if you'd rather use this pattern for a set of placemats! Sharing at Tips and Tutorials Tuesday! This month Carmit asked for improv log cabin blocks a la Sunday Morning Quilts to add to a stash of blocks that she has already collected. She gave us a list of how many blocks in each color that she was looking for and we picked which colors we would be making. She thought I was a little nuts when I told her that I would make three blocks -- one green, one light blue, and one indigo. I was totally serious! 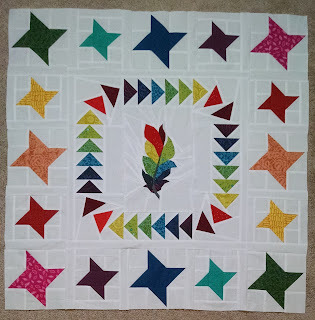 I added a few logs to each white center from my string scraps and then added a few pieced logs here and there as I continued to add to the blocks. For the outermost strips, I added slightly wider strips (2.5 - 3 inches wide rather than 1.5 - 2 inches wide) so that Carmit can trim each block down to her desired size. These were a really quick and easy block to make and I loved using up so much scrap! Have a happy weekend! Sharing at Scrap Happy Saturday and Oh Scrap! 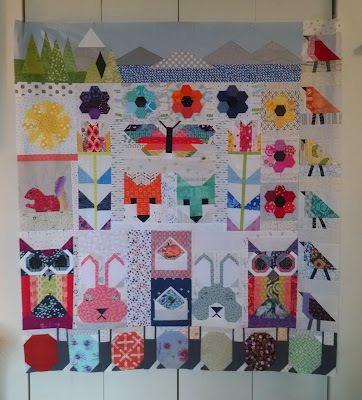 Today I wanted to share the finished versions of all seven of the quilts from my group in the Traveling Quilt Bee group I was a part of in 2016-2017. I'll start with the quilts I worked on first and move to the quilts I worked on more recently and finally show off my finished quilt. Finally, here is my quilt! It traveled all over the USA and has returned to me! 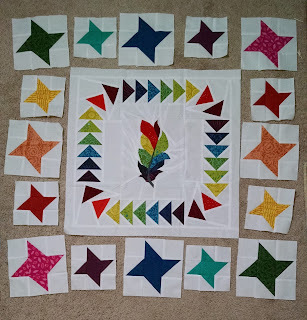 I am not sure if I will add on to this quilt or not, but part of me wants this to be a really big quilt. I am considering asking my mom and my sister to each add a section to the quilt. Happy Wednesday! Sharing at Let's Bee Social! 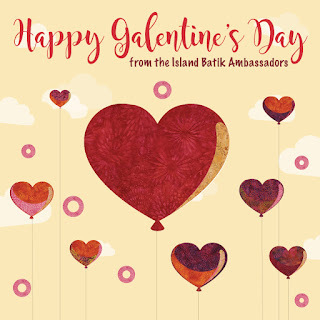 I'm excited to share that I am an Island Batik Ambassador this year! I will have lots of batik-featuring goodness this year -- including extra giveaways and tutorials, HOORAY! Check out all of this gorgeous quilty fun that I'll be using and featuring between now and July! Today I'm sharing a Galentine's Day themed tutorial using some adorable pink and red fabrics! If you aren't familiar with Galentine's Day, it is February 13th and it is for celebrating your best gal pals, and originally came about as part of an episode of Parks and Recreation, which happens to be one of my favorite shows of all time! So in the spirit of Leslie Knope, I've designed a Galentine's Day mug rug with one of her most iconic quotes, "Friends, waffles, work." I used two fabrics -- one fabric for my background and backing, and one fabric for my heart and binding. From your background/backing fabric cut one 8.5 inch square and one 9 inch square. Using your fusible web of choice (I use heavy duty WonderUnder) cut a heart shape that is smaller than your 8.5 inch square. Iron your heart onto the wrong side of your heart fabric. Trim out the heart, trimming off a little bit of the fusible web so you have a clean edge. Remove the paper and iron onto your 8.5 inch square. Using the thread and stitch of your choice (I used 12 wt Aurifil as my topstitching thread in a wide zigzag) machine stitch around the edge of your heart. Layer with batting (a great time to use those scraps!) and your 9 inch backing square. Pin as necessary. Using a thread that contrasts with your background (I again used the 12 wt Aurifil) quilt a scallop edge around your heart. Changing threads (I used red 50 wt Aurifil) quilt "Friends, waffles, work" inside of your heart. Quilt the rest of your piece as desired. I quilted additional scallops around my heart. Trim to 8.5 inches and bind as desired. I used binding strips 2.25 inches wide. Have a Happy Galentine's Day today and a Happy Valentine's day with your sweeties tomorrow! Sharing at Tips and Tutorials Tuesday, Linky Tuesday, and Finish it up Friday! As of Saturday, we are officially living in our new place! Hooray! We have unpacked a good portion of the boxes, are sleeping in our actual bed, and the bunnies are set up in their new space! 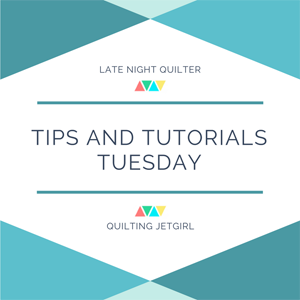 But since I haven't even seen my sewing machine in over a week (I do know where it is and how I plan to set it up) I thought I would share today about packing and moving my sewing space as a part of Tips and Tutorials Tuesday. 1. Know your moving timeline. 2. Prioritize what needs done before you move. 3. Suitcases are your friends. I packed all of my yardage into one of my largest suitcases because fabric in a box can get heavy quickly. Suitcases with wheels are your friends. I wasn't able to fit everything into suitcases but I put my lighter supplies into boxes. 4. The amount of "stuff" will surprise you. I am very guilty of harassing my husband about his book collection, but packing and moving my fabric stash, notions, and quilts has humbled me a little bit. Even if you are the most organized person in the world (which I am not) you will still be surprised with how much stuff you might have. I have put up quilts for sale as well as offering giveaways for things that I just didn't love anymore. I also went through all of my quilt magazines and ripped out patterns I wanted to keep and threw away a bunch of old issues. Be critical of what you have and what you think you will use (or never use!). 6. Think about your ideal sewing space. What is working in your current space? What is NOT working in your current space? For me, my wire rack shelving works great, but my plastic table isn't the perfect height and having a storage bin under my table makes things crowded. I plan to move the bin into a different location and save to purchase a sewing cabinet. I made sure everything for each in-progress project was all in one location -- box or bin or bag -- so that no part was lost or misplaced or accidentally used for something else. 8. Keep your rulers handy. A long ruler or flexible measuring tape works in a pinch for measuring walls and aligning pictures if you don't have a metal measuring tape handy. Be sure to pack them so that they don't get snapped (this happened to me once, it was heartbreaking!) but make sure they are accessible! For me, getting my wire rack rebuilt and everything that I store on it back together eliminated two medium packing boxes, a large suitcase, and a bunch of smaller boxes. Packed up, it took up more space than when everything was put away. We ended up having to re-use the packing boxes for other things! If there were WIPs that you somehow forgot about, you might potentially stumble upon them in the moving process! I had done a pretty thorough inventory of all of my works in progress, but I still found more orphaned blocks than I thought I had. Do you have any additional tips or ideas? 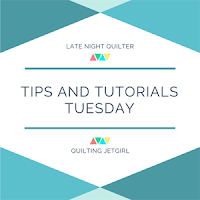 Check out everyone's tips and tutorials at Quilting Jetgirl/Late Night Quilter! Her requests were near-solid prints with a modern feel in a rich rainbow palette. 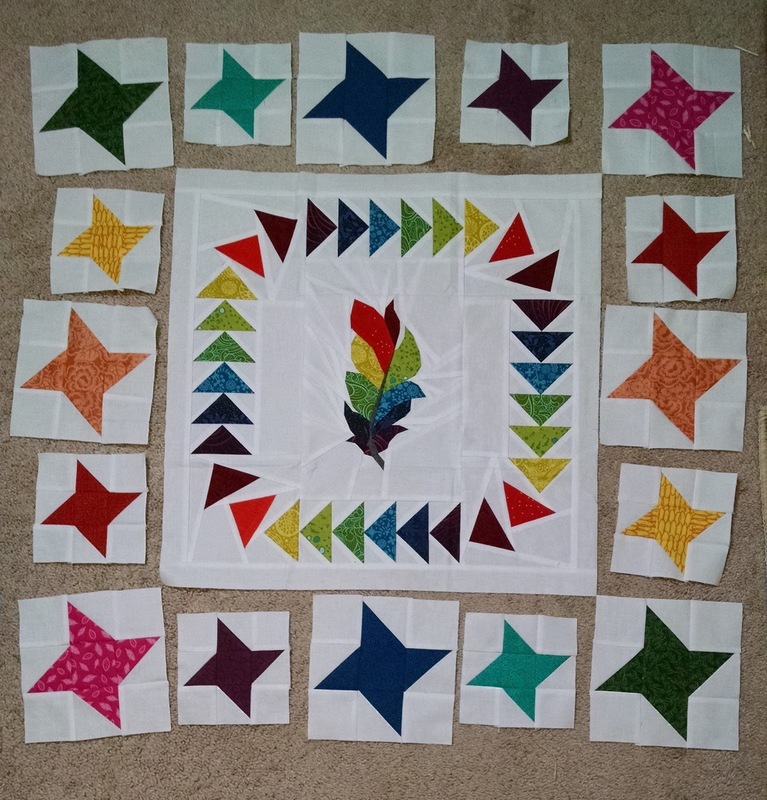 She also requested movement and classic quilt blocks. I decided to go with a ring of friendship stars around Susan's center starter. To give it more movement, I decided to alternate between 6" and 4.5" finished blocks, with all of my stars twirling in the same direction as Susan's flying geese. This beauty is on its way to Audrey and I am waiting for Susan to send me Chelsea's quilt! I'm back today with THREE giveaways to stock your quilty coffers! Second, we have a SIGNED copy of Big Block Quilts by Victoria Eapen. Finally, we have a whole stack of patterns that I have collected and will never use! 1. Leave a comment with which giveaway you'd like to win. Easy peasy. The giveaway will close Monday, February 6th, at 5 PM. That's it! I'm neck-deep in boxes, so I am looking forward to sewing again next week! Update: The giveaway is now closed! Our winners are Breanna S., Miss Pat, and ScottyLover!